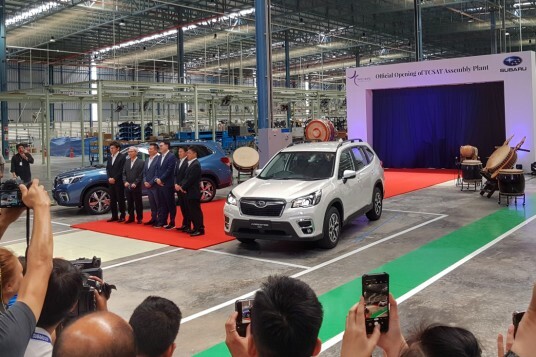 Engineering students of Universiti Malaysia Pahang will get a chance to fiddle with actual industrial tooling robots, as Perodua gave the aforementioned university 13 such robots. “Students will be able to learn – first hand – the operations of these robots and they can take this knowledge and apply it in any automotive company or any other relevant industry as they see fit,” said Perodua managing director Datuk Syed Abdull Hafiz Syed Abu Bakar at the hand over ceremony at Kuantan on 28 Dec 2009. Syed Hafiz officiates the handover. Over a 12-year period since 1997, these robots were responsible for the manufacture of 590,000 Perodua Kancils. With the Kancil now withdrawn from Perodua’s lineup, these robots, though still in good condition, were accordingly decommissioned. To ensure that the university and its students receive maximum benefit from these robots, Perodua will also provide training to the university’s technicians on the operation and maintenance of them. The robots, which would be used by the Manufacturing Engineering Faculty, is expected to benefit, on average, 200 students per academic year. “Our hope is that they take this opportunity to learn as much as they can to prepare themselves in the ever demanding job environment,” Hafiz said. Additionally, 60 less fortunate children from around Kuantan and Gambang were the recipients of a set of back-to-school items from Perodua. A small ceremony was held at Perodua Sales Kuantan branch, where the children were given stationeries, school bags, and some pocket money for the new school year.